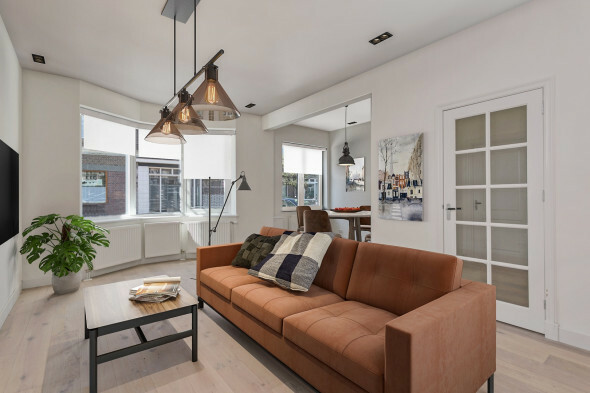 Luxuriously renovated two bedroom apartment with a lovely balcony. The apartment is fitted with a brand new kitchen and bathroom, double glazed windows and laminate flooring throughout. The apartment features new doors, flooring, blinds and is freshly painted. Perfect for young professionals or a family who enjoy this fantastic apartment. Located on the first floor. Entrance into a L-shaped hallway with modern separate toilet. Spacious and bright living room with characteristic heating covers (ca.7.15 x 3.55/2.22m). Semi open kitchen with ample cupboard space, fitted with all comforts including a built-in fridge / freezer, dishwasher, microwave / oven, stove and exhaust fan (ca.3.14 x 2.70m). The balcony can be accessed from the kitchen. Large bathroom with shower, sink and towel radiator (ca.2.61 x 2.08m). Master bedroom with built-in cupboard space and access to the balcony (ca.4.43 x 3.21/2.79m). Second bathroom (ca.2.99 x 2.59m). The balcony is located at the rear of the apartment (ca.5.50 x 0.92m). Located on a quiet street, close to shops, schools and public transportation. Located in the green Bloemenbuurt area of The Hague. 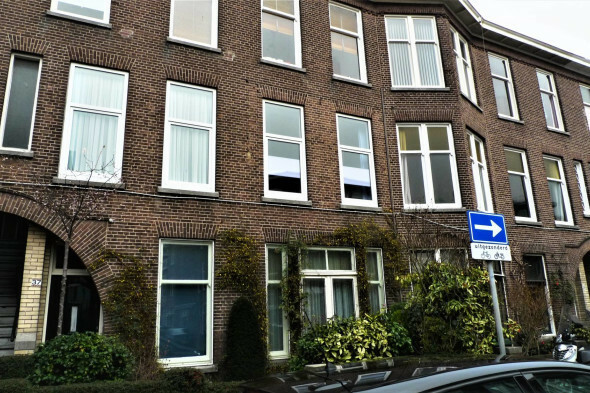 At walking distance from the nice shopping street Fahrenheitstraat / Goudenregenplein and The International and European school close by. Public transport (tram 3 and 12) within a few minutes walk. The beach, boulevard and the lively harbour with plenty of restaurants can be reached within 5 minutes.